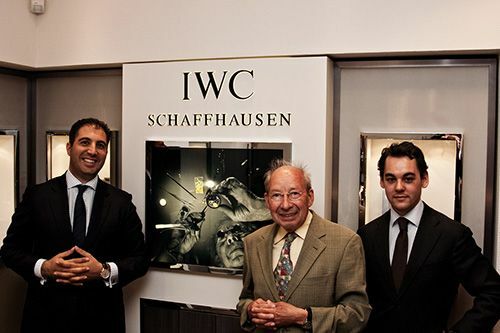 IWC’s legendary master watchmaker Kurt Klaus was over for a visit at Ace Jewelers in Amsterdam. Alon Ben-Jospeh, CEO of Ace Jewelers, did an interview with Kurt Klaus for all IWC fans over at the IWC forum of WatchUseek and captured it on video. A real treat for both all IWC fans and Ace Jewelers, known for their impressive boutiques in Amsterdam as well as their on-line boutique where they are the first to sell IWC watches as an authorized dealer. From left to right: Alon Ben-Joseph (Ace), Kurt Klaus (IWC), Dimer van Santen (Ace). For those who don’t know, Kurt Klaus is the master mind behind IWC’s Da Vinci perpetual calendar, introduced in 1985. In the interview (which consists of three parts), Kurt Klaus explains to Alon Ben-Joseph about the history of the IWC Da Vinci perpetual calendar and how it evolved during time. The success of this timepiece is explained by the fact that it was the first serial produced watch with a perpetual calendar which can be set by only the crown. No need for extra pushers to set the calendar function. Enough spoiler.. see the video below for the first part of the interview with Kurt Klaus. If you want to see the other parts, click www.acejewelers.tv for part 2 and part 3 of the interview. Over at the IWC forum of WatchUseek, you can win an IWC catalogue signed by Kurt Klaus. The only thing you’ll need to do is enter your name in the “Free IWC/Ace Jeweler Raffle” thread which has been marked as ‘sticky’ at the top of the discussions. Click here to go to the IWC forum.